Wolfe Face Art & FX is a make-up design company best known for its unique products and cutting-edge make-up application techniques. Wolfe has truly revolutionized the industry by combining traditional theatre make-up and fast-paced face painting into a totally new type of face and body art.The Neon makeup will reflect under UV light, giving a bright, shining glow-in-the-dark effect. 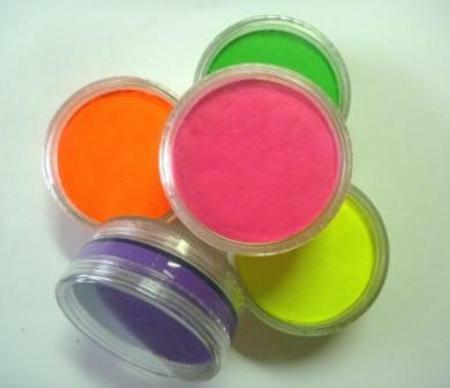 They are ideal for use under a black light, but can also be used under normal light, where their bright colours will really pop. As with all of the Wolfe make-up, the Neons are opaque, and they blend and cover with perfection. The Neon range currently comes in 8 colours.